Audi R8 LMS ultra makes its first appearance in the Pirelli World Challenge at Sonoma Raceway in Sonoma, California. GMG Racing led by James Sofronas will battle for the World Challenge Championship. DragonSpeed team principal Elton Julian will make an anticipated comeback to take the wheel for Sunday's one-hour sprint. 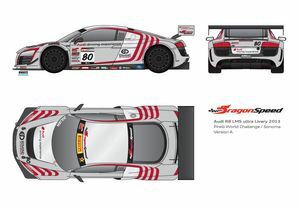 This weekend the Audi R8 LMS ultra will appear with the Florida-based DragonSpeed motorsports team during the Grand Prix of Sonoma at Sonoma Raceway, home of the Audi sportscar experience. Following a front-running position in the LMPC class in the American Le Mans Series, DragonSpeed will compete this weekend to claim the title of the penultimate round of the Pirelli World Challenge. DragonSpeed has the chance to close the gap in the World Challenge Manufacturers Championship. The announcement to allow the GT3 specification Audi R8 LMS ultra makes it possible for the car to take to the track this weekend. Audi Sport customer racing applauds the decision as it reflects the specification raced around the world in many race series. Full GT3 racing in the U.S. in the Audi R8 LMS ultra is an opportunity we have looked forward to. The ultra positions us very nicely on the track as the team looks to take the series lead. Following the SCCA's decision last week announced at Mid-Ohio to admit FIA GT3 cars to the series. DragonSpeed's entry is noteworthy -- not only does it mark the first outing for a current FIA GT3-specification machine in North America, but it is also the third event on as many continents for the team's silver and red Audi, which finished both the 24 Hour Dubai and Bathurst 12 Hour international GT enduros earlier this year. Fans can catch this weekend's race live online at www.world-challengeTV.com on Sunday, August 25 at 2:00 p.m. eastern, with broadcast coverage on NBC Sports Network on Sunday, September 8 at 3:30 p.m. eastern.